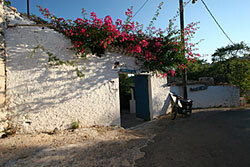 Keri is situated on the Southwest side of the island and is 15 km from the city of Zakynthos and 12 km from the Airport. Referred to by Herodotus, it is an area that combines the sea, pine forests, valleys and streams. Keri was many times in the past, the target of pirates and conquerors. The people of the village over the years have been humble farmers, fishermen, woodcutters and shepherds who struggled with the land, poverty and the difficulties which existed in all seasons. At the same time they developed many cultural values; their love of song, dance and music is renowned and popular theater or 'Speeches" another name for street theater, were enjoyed by the entire village. Many groups of wonderfully harmonious street singers have also developed. Tradition and culture blossomed alongside the natural beauty and with this came tourism which today makes Keri one of the highest quality tourist destinations on the island as it combines all the desirable elements of nature, tradition and culture. Most of the businesses are family run thus giving a chance to the visitor to come into contact with the local culture. Come and experience Easter at Keri with century old traditions and its beautifully kept church which is of historical importance. Come and visit the village in May and see for yourself the astonishing variety of wild flowers. Come during summer and swim in the turquoise waters or take a trip to the Keri Caves. If you have a boat, come and anchor at our beautiful natural harbour and if you don't, let one of our experienced captains take you on a trip around our fascinating coast, rich in geological wonders. Come in September and join us in the wine making procedure. Come in October and see how we make the famous Zakynthos olive oil, try our local specialties and enjoy our hospitality. Come and enjoy the underwater world at our diving center. Come and see the famous Herodotus Spring and the magical odyssey of the sea turtle Caretta-Caretta as it makes its way back to the island of its birth, after 40 years, to give birth to a new generation on the sandy beaches in the Laganas bay. Come and see the sunset from the Keri Lighthouse... walk in the pine forests. Every one of your days here will bring something new to experience and enjoy. 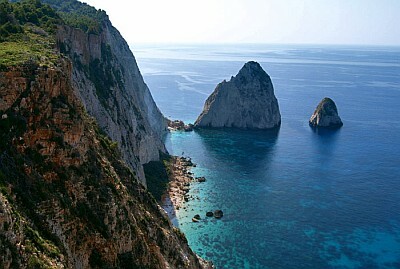 Zakynthos is one of the largest islands in the southern Ionian Sea. It lies only 1 hour from Cephalonia and the Peloponnese. Favored by its geographical position, it is easy for the visitor to get to know the other Ionian Islands from here or go across to the mainland, to ancient Olympia or even to Athens, 5 hours away. An island full of contrasts, Zakynthos is mostly mountainous with hills and fertile plains. Its mountains are pine-covered while its plains are dotted with olive and citrus groves or vineyards. It has countless sandy beaches as well as an impressive rocky coastline. Many marine caves have been formed there such as the marvelous Galazia Spilia (Blue Cave) in the northwest part of the island. 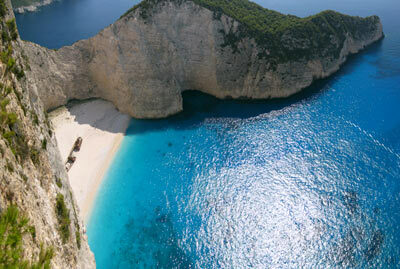 Zakynthos has a mild Mediterranean climate suitable for year round holidays. It is dry and cool in August with an average high of 27 degrees Celsius. Showing a particular sensitivity in regard to their environment, the people of Zakynthos have kept large areas of the island as their aim was to protect and preserve rare kinds of marine fauna and the creation of marine parks. The well-known Mediterranean Sea turtle, Caretta-Caretta, which has used the southern shores of Zakynthos for millions of years as a place to lay its eggs, has found a safe refuge in protected sandy beaches. The same is true for a type of rare seals, the Monachus Monachus (monk seal) found on the southwest coasts of Zakynthos. Indicting their respect for the environment, the inhabitants of the island have taken care not to disturb its fragile ecosystem. The modern settlements and tourist installations, built while keeping the traditional color of the island, are in harmony with nature and ensure that every visitor can enjoy modern comforts and service in natural and cultured surroundings. Zakynthos is truly an island that to know is to love. Most of the 44 villages have been developed but not at the expense of their traditional color. Tourism has only gradually expanded and the inhabitant's sensitivity to their environment has kept enormous complexes from overwhelming the island's natural beauties. Here you will find medium and small-sized hotel units for every purse, which offer not only all modern comforts but also service which has been transformed into genuine hospitality. The oldest findings of bone fossils in the bay of Laganas are from the Paleolithic era. According to Homer, the first inhabitant of the island was Prince Zakynthos, the son of King Dardanos of Troy, who arrived here between 1500 and 1600 B.C. Thereafter, the island was inhabited by the Arcadians, whose culture developed through the exploitation of the fertile soil. They went on to create colonies (the well-known Zakantha in Spain, whose culture flourished for more than a thousand years, until 218 BC when it was destroyed by Annivas). Another colony was also Kodonies in Crete. 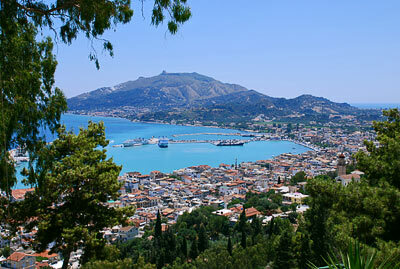 Afterwards, Zakynthos was conquered by King Arkisos of Cephalonia and was subsequently reconquered by the famous Ulysses. 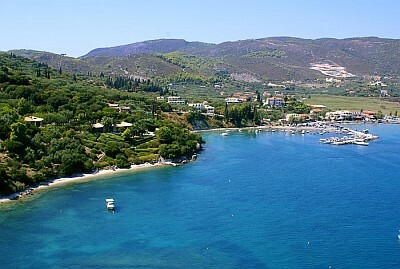 Upon Ulysses’s return to Ithaca and with Neoptolemos' mediation, a treaty was signed granting autonomy and democracy to the island, the first in the Hellenic area. From 455 B.C. Zakynthos was allied with the Athenians and Corfu, and faced the Corinthians together. After the defeat of the Athenians in Cicily, Zakynthos was conquered by the Lacdaimonias (Sparta), who imposed an oligarchic regime. Later on, the inhabitants rebelled and re-established democracy. During the Macedonian War, the island was occupied by the Macedonians, and afterwards by the Romans. After the first years under the command of a Roman governor, the island was granted the right to be governed by its own laws, have its own municipality, parliament, legislature, and currency with a local symbol. 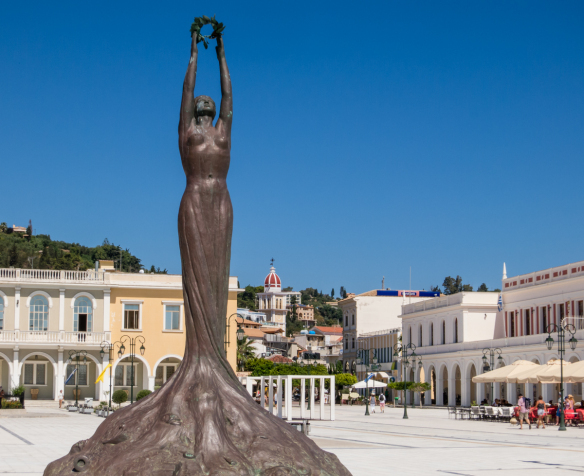 This era contributed to a great cultural development in Zakynthos. Constantine the Great, during the Byzantine era, included Zakynthos in the province of Illyria. During this time, the island suffered from pirates and, later on, also from the Crusaders, passing from the East to the West. In 1485, the Venetians occupied the island again and called back the inhabitants to their fields and homes. In the famous Libro d`Oro, you will find recorded the names of the Venetian nobility. The island developed, and the city was reconstructed in an impressive architectural style. From these times on, Zakynthos was named the Florence of Greece. Separation of the population into "nobili", "civili" and "popolari" took place. The popolari rebelled against the nobili. The revolution is also well known as the "rebellion of the popolari". In October 1798, the Turkish fleet besieged Zakynthos. On March 21, 1800, a treaty between Turkey and Russia was signed. This contract established the first independent Greek State of the Seven Islands and was effective for seven years. In 1809, the British fleet occupied Zakynthos, and Zakynthos then became the titular capital of the Ionian State. At the same time, the rest of Greece was under Turkish occupation. With a base in Zakynthos, the Philiki Etairia (Company of Friends) promoted the rebellion against the Turks. In 1830, Greece became independent. Then in 1851, a member of Parliament Ioannis Typaldos Kapelatos suggested the union of the Seven Islands with Greece. The British reacted violently, but the Zakynthians under leadership of Constantine Lomvardos carried on the struggle for the union with Greece. Finally, on May 21 1864, the Greek flag was raised on the island. Limni Keriou lies to the south, 20 km from Zakynthos-town, in the island's most fertile valley, among olive groves and vineyards. A cosmopolitan place with rooms to rent, camping and a little nightlife, it is suitable for both pleasure-loving visitors and quiet family holidays. The sea turtle Caretta Caretta can be found in the extensive Bay of Laganas. Also to be found on the beach at Limni Keriou is the Diving Center Turtle beach. The owner of this diving centre, Timotheos Karmiris, has been active for years in and around scuba diving. In the beginning of 1997 he opened the Diving Center Turtle Beach that immediately turned into a success. Zakynthos is being discovered more and more amongst scuba divers and the demand for a good diving centre is getting bigger. Together with a professional and enthusiastic team, the Diving Center Turtle Beach has quickly gained its good reputation.